A seemingly tame leopard used for a publicity stunt escapes and kills a young girl, spreading panic throughout a sleepy New Mexico town. In 1940, a former prisoner is determined to find the killer of the New York Police Lt. who helped him escape from a Nazi torture camp in Spain. Captain Will Stone: [the freighter 'Altair,' under his command, is now underway] It's good for a sailor to go to sea. It's even better for an officer... Ah, it's a good feeling. In San Pedro, I was just another captain. At sea, I am... *THE* captain. Q: What is 'The Ghost Ship' about? 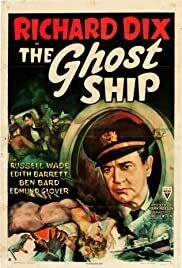 Q: Why is the movie titled 'The Ghost Ship' when there are no ghosts in it? Q: Is 'The Ghost Ship' based on a book? Perhaps not as mesmerizing as "Cat People" or as disturbing as "The Body Snatcher", but this still definitely is a genuinely creepy golden oldie horror gem like only the great Val Lewton could produce them back in the 1940's. This dark and atmospheric chiller takes us aboard a giant ship in order to examine the mysterious deaths of several crew members. They all seem like unfortunate accidents, but pretty soon the young and ambitious officer Tom Merriam suspects that Captain Will Stone abuses his power in order to get rid of rebellious personnel. The film is terrifically cut in half when the ship sets ashore and Merriam prosecutes the influential and highly respected captain. From then on, the nemesis between the two is frighteningly illustrated and a drama on-board the ship seems inevitable. Richard Dix is outstanding as the tormented Captain Will Stone! He looks naturally eerie and definitely not man to argue with. The black and white photography is stunning and the constantly sung sailor-song will remain stuck in your head, even long after you finished watching the movie. The Val Lewton horror of course isn't very explicit (considering the time and budget) but this movie does contain at least one truly unsettling sequence; when a giant chain crushes a crew member. My advise is to watch this classic as soon as you can, if it were only for the ultra-eerie mute in the supportive cast!